Pro sponsored the Crédit Agricole squad last season and has now introduced a Thor Hushovd signature series. Primarily, the series is a customised Vibe 7S OS road series bar and stem with a HP black finish with Hushovd custom graphics. The Vibe 7S OS stem uses an oversized triangular design produced from 3D forged AL-7075 T6 to give an optimum strength-to-weight ratio. Weight comes in at a very respectable 120g, and it is available in ?10 degrees with a 31.8mm clamp and ranging from 80-140mm lengths. 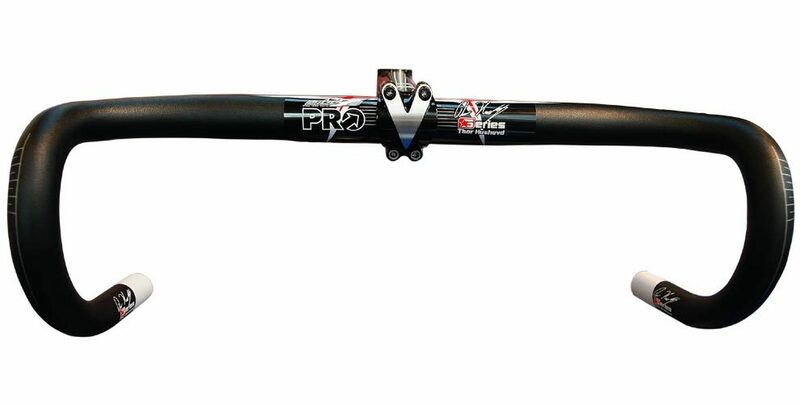 Complementing the signature series stem is the Vibe 7S Round OS bar. Designed with no difference in diameter along the tops, this bar has been designed for maximum stiffness. Made from AL-7075 the bar features a traditional round bend design with a weight of 275g, making it a reasonable compromise between weight and strength. Sizes available will be 40, 42, 44cm (centre-to-centre) with a bar clamp of 31.8mm.